LABOR may be next to feel the heat over federal parliament's citizenship imbroglio, with the government said to be preparing to challenge up to five opposition MPs to prove they were properly elected. The coalition appears willing to use its numbers to challenge Labor MPs Justine Keay, Susan Lamb, Brendan O'Connor, Maria Vamvakinou and Tony Zappia on the grounds they've not done enough to end doubts over their bona fides, The Australian reports. 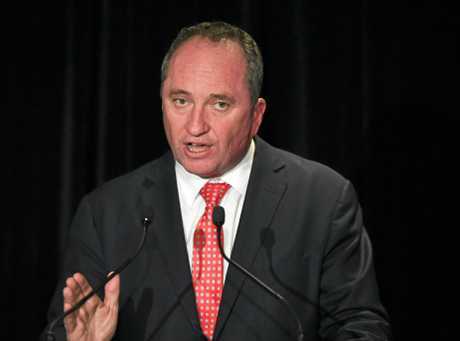 It comes as the Turnbull government was yesterday thrown into turmoil after Deputy Prime Minister Barnaby Joyce revealed he is a New Zealander. According to The Australian there is an expectation the government will scrutinise the opposition MPs is a result of suspicions Labor encouraged its Labour allies in New Zealand to raise questions about Mr Joyce's citizenship. But senior Labor figures insist the party has rigorous vetting processes in place for candidates. "We are entitled to be absolutely confident that we don't have a problem," frontbencher Joel Fitzgibbon told ABC radio today. 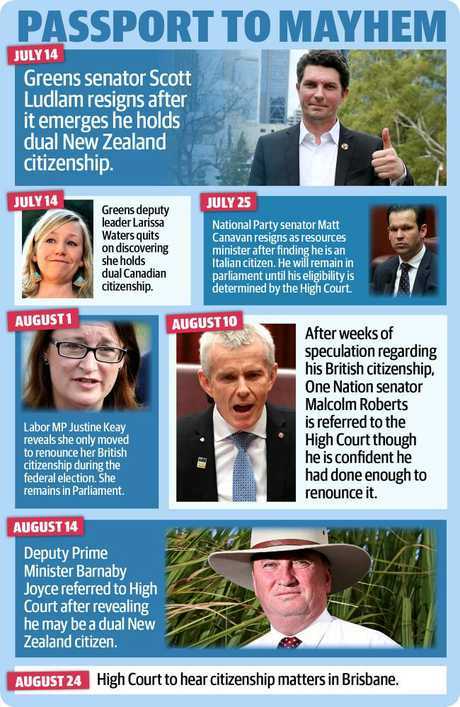 Mr Joyce was yesterday taking "urgent steps" to renounce his Kiwi citizenship, in the latest chapter of the growing dual-citizenship crisis, which has already involved five federal MPs. The stunning news came about after the New Zealand High Commission requested a meeting with the National leader last Thursday to tell him he was eligible for a passport for the land of the long white cloud. "Needless to say, I was shocked about this," Mr Joyce said. "The concept of New Zealand-Australian citizenship was not created until 1948. "Neither my parents nor I had ever applied to register me as a New Zealand citizen. The New Zealand government has no record of registering me as a New Zealand citizen." The High Court ruling on whether Mr Joyce is a dual citizen - and therefore if he is eligible to serve in Parliament - could prompt a by-election in his New England electorate, around Tamworth in northern NSW. This could place the government's majority into serious question. 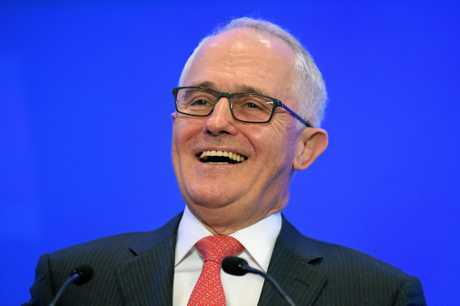 Prime Minister Malcolm Turnbull said Mr Joyce should remain as Deputy Leader and in Cabinet, so confident is he that the High Court will clear him, saying the matter goes to "the heart of our democracy". "Based on advice from the Solicitor-General, the government is very confident the court will not find that the Member for New England is to be disqualified from the Parliament. 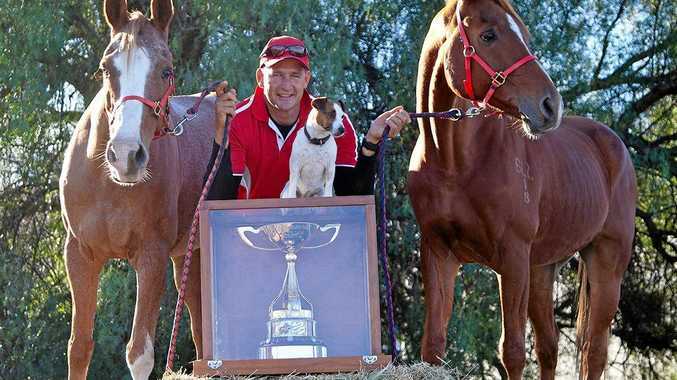 Very confident," Mr Turnbull said. "Now, if an Australian citizen, who became a citizen of this country by reason of being born here, was to be ineligible to stand for Parliament because the law of a foreign country imposed foreign citizenship on them without their knowledge, due to their descent from a parent, grandparent, great-grandparent, then, plainly, millions of Australians could be disqualified from standing for Parliament." The Daily Telegraph understands the Solicitor-General's advice outlines the reason for a dual-citizenship test is to make sure MPs do not have an allegiance to another country. Under the definition of what is a dual citizen, the Solicitor-General stated very firmly that Mr Joyce did not qualify. New Zealand's Prime Minister Bill English confirmed Mr Joyce was a citizen of his country under New Zealand law. Mr Shorten's response to the Prime Minister's letter. The letter from Mr Turnbull to Bill Shorten, after questions were raised about Barnaby Joyce's dual citizenship. "They say that, unwittingly or not, he is a New Zealand citizen," Mr English said. "Then it's a matter for the Australian system to decide how Australian law applies in his case and how they deal with the issue." 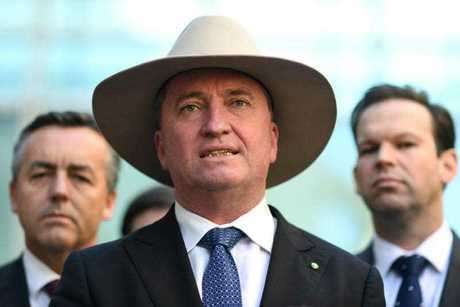 Mr Joyce is the fifth politician to be referred to the High Court in the dual-citizenship shemozzle after Greens Larissa Waters and Scott Ludlam, the Nationals' Matt Canavan and One Nation's Malcolm Roberts. A decision should be known by December. 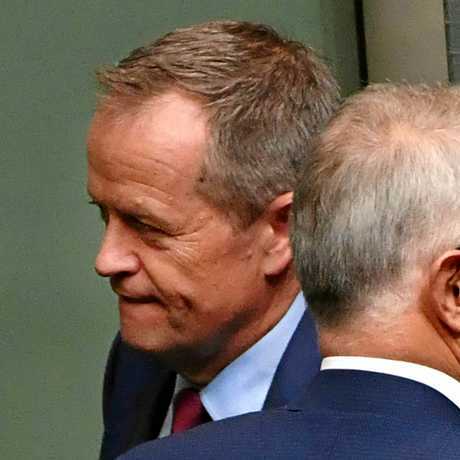 Opposition Leader Bill Shorten rejected a request from Mr Turnbull to nominate Labor MPs or senators who needed their citizenship examined by the High Court. He wrote to the PM saying Mr Joyce's "questionable status" was an "incredibly serious development". "It goes to the legitimacy and integrity of your government," Mr Shorten said. New Zealand's High Commissioner rang last Thursday afternoon to request an urgent meeting with Mr Joyce, which took place at 5.30pm. He said a question on notice had been lodged by New Zealand Labour MP Chris Hipkins regarding Mr Joyce's situation, and their preliminary view was he would be considered a Kiwi. The government argues Mr Joyce's situation is different from Mr Canavan's because in that instance the senator's mother made an active application for her son to become an Italian citizen. Mr Canavan was also registered on official databases as an Italian citizen, while Mr Joyce does not appear on any such New Zealand registry.